Summer is finally over. We don’t have to deal with sweaty days and the scorching heat for months now. The season of rain is finally here. Though monsoon is definitely a huge relief, it brings along with it some of the wettest days of the year. And these rainy days are a nightmare for all the electronic gadgets, especially your smartphone. We carry our smartphones with us at all times. So, if you don’t already own a waterproof smartphone, it is time to get one. 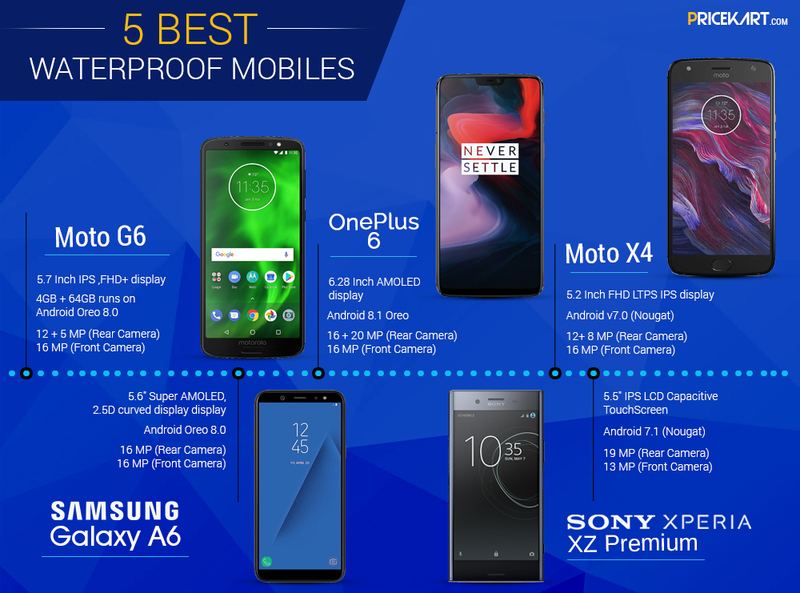 There is a huge list of waterproof smartphones in India. And not just the monsoon, a waterproof smartphone is a must if you are prone to minor accidents. We bring you a list of smartphones that are not too pricey. 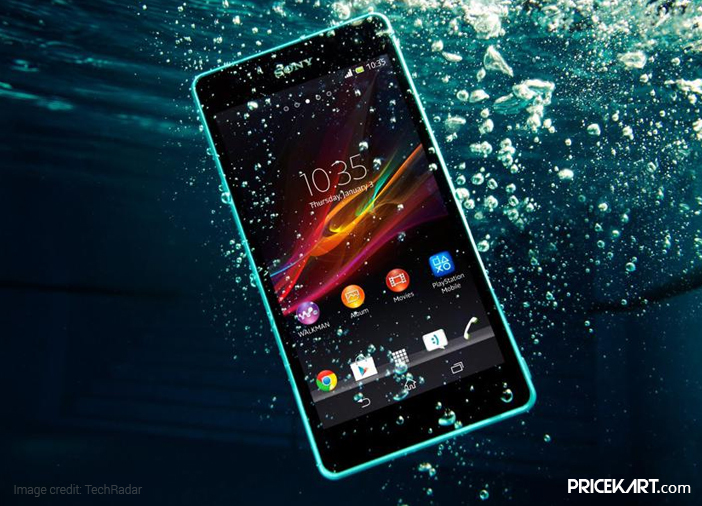 Take a look at the top waterproof smartphones that will survive through the monsoon season. The first on our list is the Motorola Moto G6 smartphone. It is not entirely a waterproof smartphone but a water-resistant smartphone instead. Moto G6 can easily survive splashes of water as it comes with a water repellent coating inside and out. Additionally, the specifications of the smartphone include a 5.7-inch IPS FHD+ display and it runs on Android 8.0 Oreo. 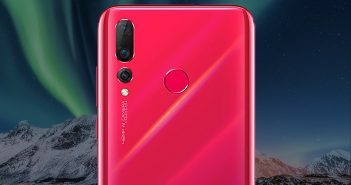 It has pretty decent camera specifications, with a 16-MP front camera and 12+5-MP dual rear camera. It is a pretty good pick for a smartphone below 20000 price range. Samsung Galaxy A6 is one of the Galaxy models that the company launched in the early months of 2018. The smartphone comes with an IP68 rating which makes it both waterproof and dustproof. So, Samsung Galaxy A6 is a smartphone that you can take along with you in the shower or even swimming. Furthermore, the smartphone comes with a 5.6-inch Super AMOLED curved display with thin bezels. Design-wise, the Galaxy A6 is compact, sleek and sports a solid build. Moto X4 is one of the best waterproof smartphones on our list. With an IP68 rating, the phone won’t just protect itself from splashes, puddles or accidental spills, but will also stay unharmed when dunked entirely in water. This phone can withstand staying up to 30 minutes in 6 feet deep water. 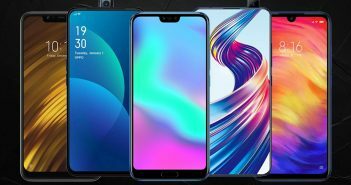 And, for a pretty convenient budget, the smartphone offers features like an amazing front and rear camera, great software and Stock Android experience. The latest offering by the Chinese company, OnePlus 6 is not waterproof. However, it most certainly is water resistant. Every phone needs an IP67 or IP68 rating to be termed as waterproof. And OnePlus 6 does not come with any of the ratings. Nevertheless, the smartphone can withstand splashes of water. The reason that this smartphone is on our list is that it offers a lot of amazing features. In other words, the smartphone is a performance master. It has a powerful battery, amazing camera, and a powerful processor. Plus, the smartphone has a glass build which makes it look pretty amazing. And lastly, on our list of waterproof smartphones, we come to the Sony Xperia XZ Premium smartphone. Similar to Moto X4, even this smartphone sports an IP68 rating which makes it dust and waterproof. This smartphone can be taken in 1.5m of water for up to 30 minutes without a worry. So, it won’t just stay protected from the rain but can be used to take amazing selfies in the monsoon. 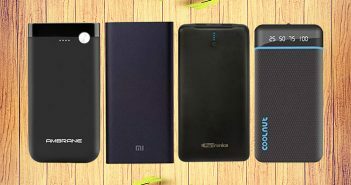 Moreover, the smartphone is equipped with most of the features of a premium smartphone. Previous ArticleAndroid P Vs iOS 12: Who is Leading the Battle of the OS?